A drive-by Kalahari shows obvious plans for future expansion; but, it’s what’s “on the menu” inside that’s illustrating evolution this Spring. Recently adding new General Manager Arthur Keith onboard, the popular destination welcomes another view added to an ongoing lineup of success stories focused on entertainment. Bringing a Northeast vibe; the Upstate New York native shares embracing energy through observation is where inspiration thrives. He explains walks through the resort resonate excitement from guests, both young and the young-at-heart; plus, talented Kalahari associates. “I love leading leaders,” smiles the Cornell [University] grad, revealing his own blend of 30-years+ experience at destinations across Las Vegas, Orlando, and Nashville will add to the positive attractions- plus- positive professionals “formula” for success. Folding even more opportunities to welcome neighbors living, working, and staying around the community inside to add “play” to the equation; he told of free valet service at the resort’s Sortino’s and Double Cut restaurants. Admitting he enjoys sitting with awesome eats and libations surrounded by live entertainment; intent to bring local performers is the plan. 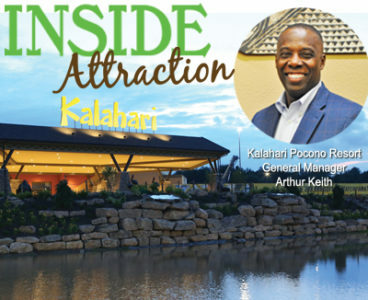 Watch for Kalahari updates at ThisWeek.net on “local vocals” slated to set the stage for an entertaining evening out in the Poconos!